September 8, 2018, Madison, AL. The Wounded Warrior Amputee Softball Team (WWAST) schedule brought the team to Madison, AL for a three game series. As Presenting Sponsor for the event, S3 had the honor of throwing out the first pitch during the kick-off the game against Redstone Arsenal. S3’s Senior Vice President of Training and Systems Support (TSS), Bob Johnson threw the game ball across the plate to WWAST player Saul Monroy. 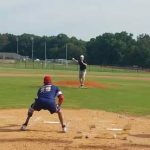 The series also paired WWAST against Madison City and Madison Academy (coaches and parents). 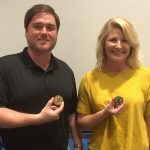 S3’s Jameson Salmon and Boston Claborn receive appreciation coins from AUSA’s Young Professionals Organization. S3’s Jameson Salmon and Boston Claborn assisted the AUSA Young Professional Board with various coordination activities leading up to game day. Both Jameson and Boston are credited with recruiting five sponsors, helping with lodging, providing social event planning, and assisting with the welcome reception for the WWAST team. WWAST is a 501(c)(3) public charity whose mission is to inspire and educate others, while enhancing the health and welfare of Wounded Warrior Amputees. The team is comprised of young, competitive, athletic veterans and active duty soldiers who have lost limbs.